IMHO, Simon is the kind of horse that any barn would be happy to have. 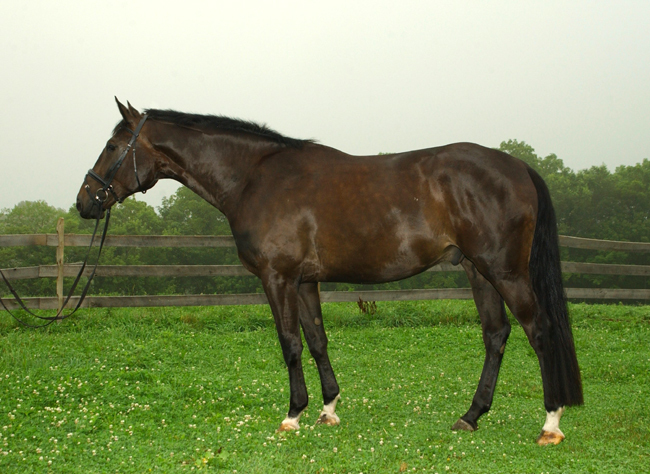 He's not an A-circuit hunter or a Grand Prix dressage horse, but he's a good all-rounder and an appealing horse. I sold him in about ten days. The first buyer, from Massachusetts, was scared away by some mild spurring that my vet had also found, but she was unconconcerned -- thought they were typical warmblood x-rays. Luckily for me, the second buyer was waiting in the wings, and she snapped him up. Simon is still with this nice lady. I think he is now 12 years-old, and he is still going strong. So take a look at Simon's conformation shot, below. I think he is around four years old here. On the positive side, I think he is pretty harmonious and proportional for a big young horse. Each part individually is average or better -- nothing is awful. He's not terribly muscled over the croup, but you'll see no sign of this in a mature horse photo of him (to be shown in another post). At this stage he is a little short through the hindquarter here, and his gaskins appear a little thin. His shoulder is straight-ish, and a little muttony. That shoulder does not usually produce an expressive front leg, and he had fairly straight hunter action. He was very correct in his movement. His head is a little large but a lovely honest eye makes you forget about it :-). His neck is set reasonably well and he's level, but not particularly uphill. Conformationally, I don't think dressage would be precluded. But in the end, I think his temperament and his huge, ground-eating canter made him an ideal hunter type, or maybe a foxhunter. He didn't have the fire in the belly to event. I dunno, what do y'all think? Am I right? Whoa!! What a big beauty! You're right; I LOVE his eye. Awesome you get to keep in touch and follow him some. 17.3hh? I'd need an elevator to get on. WOW! Absolutely gorgeous!! He is a stunner. His confo just screams Hunter to me, so I'm glad that's what he wound up doing! What a handsome guy. I'm very glad you've been able to keep tabs on him, which of course is ideal if you sell a horse. Good for you!